Resale Certificate*: Mark if you have a CA resale certificate on file with us. If not contact us at (714) 907-0682. 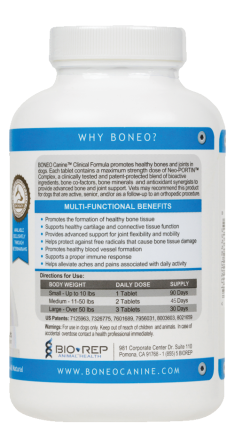 BONEO Canine® Clinical Formula delivers powerful bone and joint support to dogs with advanced needs. This maximum strength formula was designed specifically to address the complex demands of veterinarians and veterinary orthopedic surgeons. It works by actively supporting bone turnover, which can be beneficial for dogs that are undergoing bone healing and in fracture management with surgery or splint stabilization. In veterinarian-supervised case studies, this product was shown to have a positive effect on bone healing time in routine surgeries like TPLO or TTA procedures. 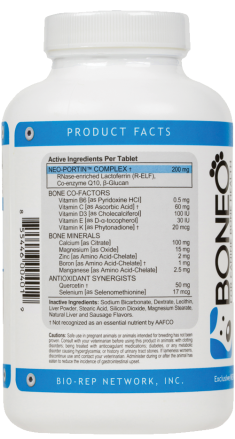 BONEO Canine® Clinical Formula has a maximum strength dose (200 mg) of Neo-PORTIN® Complex, a patented protein-based technology that promotes bone turnover, enhances absorption of nutrients, and supports healthy joint function. 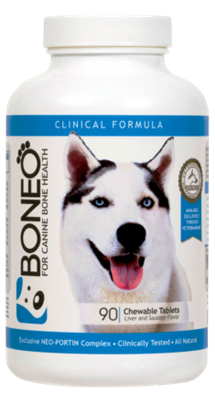 The formula is also fortified with bone and joint specific vitamins, minerals and antioxidants for comprehensive and effective support. BONEO Canine® Clinical Formula is sold exclusively through veterinarians, veterinary orthopedic surgeons, and animal health clinics. Your veterinarian may recommend this product if you have a working dog, senior dog and/or as a follow-up to an orthopedic procedure. It may also be given to dogs that need a glucosamine alternative or require additional bone-nutrient supplementation.